The polls have been averaged and the results are in. 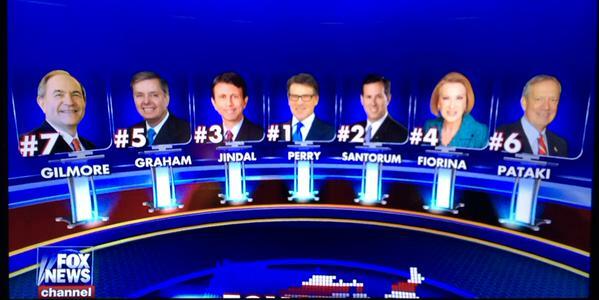 Fox News has released the official candidate list for the 5pm and 9pm debates taking place on Thursday, August 6. The early debate will feature all candidates outside the top ten, while the primetime event will feature the top 10 Republican candidates in an average of five national polls. 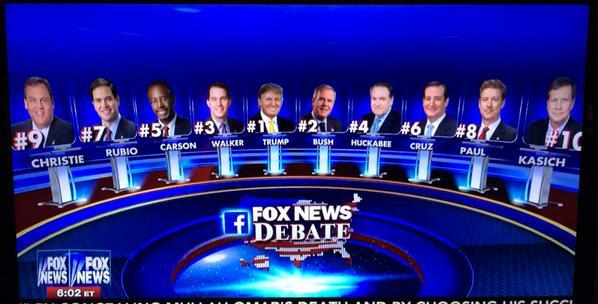 Not much of a surprise here with the exception of Kasich who only announced his candidacy weeks ago. It may have been smart to get in just before the debate since it lifted him into the top ten knocking out Texas Governor Rick Perry. Next articleHas anyone noticed Hillary’s poll numbers? The Weekly Standard Newsletter says Trump has nothing to gain from the debate, figuring he’s reached his peak. I’d bet money against that. He’s going to come off as the only fighter, among cold fish. He’s a TV star, for crying out loud, and he doesn’t think he’ll win, so he can say anything he wants. He might fade later, but this is going to push him into the stratosphere. WSN also thinks Walker could gain. Probably not. A lot of people like what he did in Wisconsin, but this is the first time that they’ll see that he’s, basically, goofy looking. He tends to make weird facial expressions that don’t match what he’s saying. I also think JEB could do very well. Up to this point, all people know about him is his name. I think they’ll be pleasantly surprised that he’s not at all like his brother.